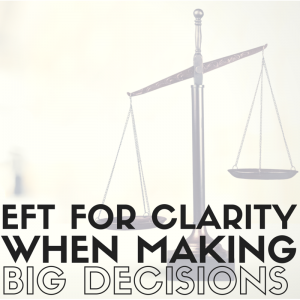 Making big decisions can be difficult because the choices aren’t always clear-cut and there may be many pros and cons to consider. When this happens it can cause us to seize up and fail to make a choice at all. Here is a tap-along audio to help you clear your head and make the best choice you can. I liked this a lot and will use again in the future! Thanks so much, and I hope your trip to London was fun and fruitful! Happy holidays, and thanks for your good service to the tapping community. Gene, thanks. Just what I needed. I drove myself crazy with overwhelm concerning a big decision. This tapping took me out of myself giving me space to breathe and understand myself just a little bit more. Thank you Gene. That provided me understanding. We make correct choices everyday that we pay no attention to and give space to the few errors that hold us back.